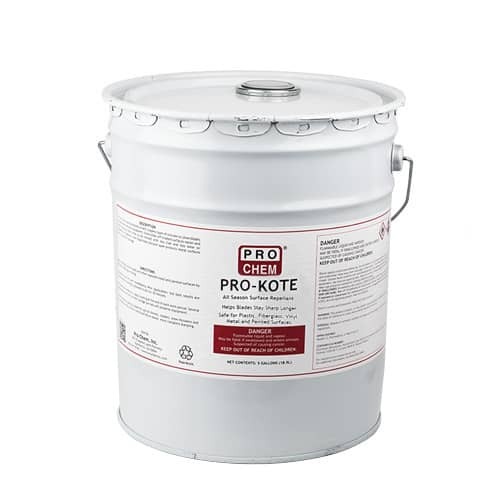 PRO-KOTE | Pro Chem, Inc.
PRO-KOTE is a specially formulated coating for use on the underside of lawn mowers, weed eaters, hedge trimmers, rototillers and other lawn maintenance equipment. It prevents grass clippings and dirt buildup, clogging and wear-and-tear on equipment. It helps blades stay sharper longer, making equipment last longer. This creates a barrier to protect metal, fiberglass, plastic and painted surfaces from buildup and damage. PRO-KOTE provides a protective film, preventing asphalt from adhering to dump beds on asphalt trucks. This safe-to-use coating will not degrade the asphalt and will protect the bed from rust and corrosion. This protective barrier resists graffiti and other stains. It prevents staining and corrosion from urine on bathroom stalls and keeps food from staining smooth restaurant surfaces* such as vinyl booths and plastic or varnished partitions. It may be applied to metal, vinyl, Formica and enamel. Leaves a hard, slippery surface of silicone on blades, shovels, etc. Spray surface to be treated and allow to dry. For Indoor Use: Wipe off excess with clean, soft cloth to polish. Avoid overspray on flooring as surface may become slippery. Equipment may be used immediately after application, but best results are obtained when coating is allowed to dry for 30 minutes. For maximum protection, apply coating at the end of each work period.